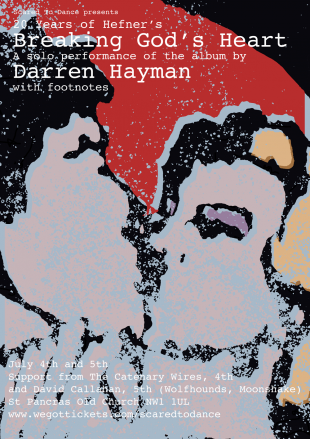 Scared To Dance presents Darren Hayman performing Breaking God’s Heart at St Pancras Old Church. Wednesday 11th July support comes from Alan Tyler and on Thursday 12th July Birdie supports. Both nights are sold out. Darren Hayman is a thoughtful, concise and detailed songwriter. He eschews the big, the bright and the loud for the small, twisted and lost. For 15 years, and over 14 albums, Hayman has taken a singular and erratic route through England’s tired and heartbroken underbelly. Hayman was influenced by punk through his art college years, but throughout the ’90s he was inspired by American lo-fi indie-rock. A chance meeting with John Peel favourites New Bad Things and shows with them in London and Portland USA taught Darren the DIY ethic and soon he was self-releasing records by his first band, Hefner. Hefner’s first records attracted the attention of cult indie label Too Pure and the broadcasting legend John Peel. The band’s first album, Breaking God’s Heart (1998), mixed raw, sexual words with religious imagery and earned the band a loyal, intelligent following in the UK, Europe and the USA. He’ll be performing this seminal album solo and in full on its 20th anniversary. Alan Tyler is the lead singer of English country rockers The Rockingbirds. He has also released albums with The Lost Sons of Littlefield, his ongoing acoustic trio The Alan Tyler Show, and as a solo artist. Deborah Wykes and Paul Kelly met whilst taking sabbaticals as members of Saint Etienne’s band in 1994. Both had been writing their own songs and discovering a mutual love of The Shangri-Las and Love’s Forever Changes, formed their own band, Birdie. Both members had previous musical jaunts. London native Wykes opened for the likes of The Fall, The Jam and The Undertones while fronting her band Dolly Mixture. Kelly, known for his stint with East Village, also shared a label with Manic Street Preachers. Their last release was the rarities compilation Reverb Deluxe in 2003. Wednesday 4th July support comes from The Catenary Wires and on Thursday 5th July David Callahan from The Wolfhounds supports. Both nights are sold out. The Catenary Wires are Amelia Fletcher and Rob Pursey. They formed in 2014 and their debut mini-album Red Red Skies was released a year later on Elefant Records in Europe and Matinée Recordings in the USA. Amelia and Rob are best known for making fuzzy, sixties girl-group inspired indiepop in their previous bands Talulah Gosh, Heavenly, Marine Research and Tender Trap. David Callahan is the frontman of The Wolfhounds. Formed in Essex in 1985, the band released four LPs in their first incarnation until 1990 including a spot on the NME’s legendary C86 compilation. Whilst on hiatus, Callahan resurfaced with the much-lauded Moonshake on the Too Pure label. Co-led with Margaret Fielder, the band was notable for its extensive use of textures and sampler technology in a rock context. Since reforming in 2005 The Wolfhounds have returned with two well-received albums and continue to perform across Europe. 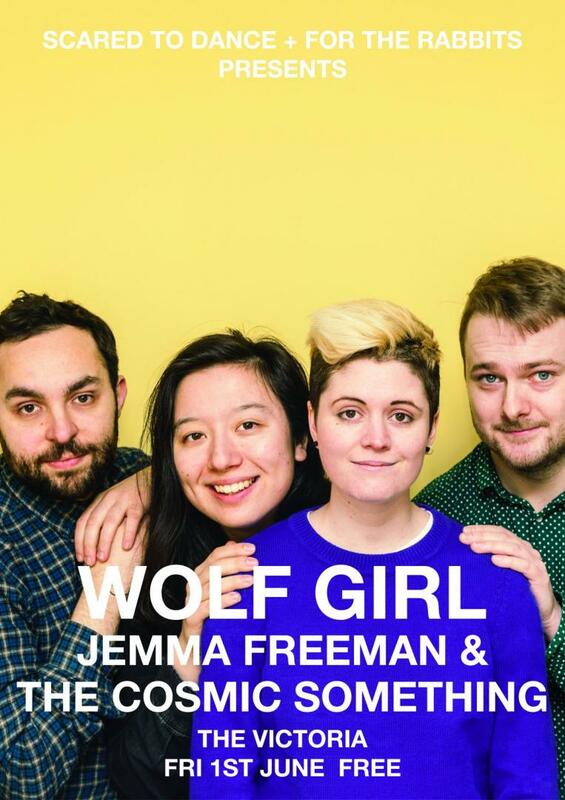 Wolf Girl headline the Scared To Dance and For The Rabbits gig night on Friday 1st June at The Victoria. Entry is free and support comes from Jemma Freeman and The Cosmic Something. 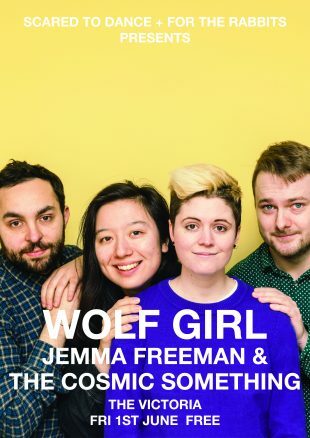 Wolf Girl are a noisy pop four-piece based out of the fertile South London DIY scene. Combining crunching distorted guitars and powerful, driving rhythms with hook-laden melodic pop, their music explores themes of sexuality, gender identity and anxiety. They first burst onto the scene with 2014’s EP Mama’s Boy on the much missed Soft Power Records before releasing their self-deprecatingly titled debut album, We Tried, on Odd Box Records in 2016. Featuring members of Suggested Friends and The Whooperups, the band have toured extensively, sharing their “riot grrrl-doo-wop heartbreakers” to receptive audiences across the country. Expect to hear brand new tracks, with the release of an as-yet-untitled album set for some point in 2018. The Cosmic Something is the new solo project from Jemma Freeman, known as the songwriter and guitarist in Bella Union signed dreamy-psych band Landscapes and member of new wave art band, The Fucks. Jemma’s solo material adds a fizzing energy and almost glam-stomp to proceedings, creating a sound that flips rapidly between lush guitar work and rapid fire energy, all topped by Jemma’s sonorous vocal, part Kate Jackson part PJ Harvey. Expanded to a four-piece live band, expect to hear material from 2017’s debut EP, Someone Else to Blame as well as new material set for release later this year. Sweet Baboo headline the Scared To Dance and For The Rabbits alldayer on Saturday 5th May at The Victoria. Tickets are now on sale from WeGotTickets. Sweet Baboo is Stephen Black. 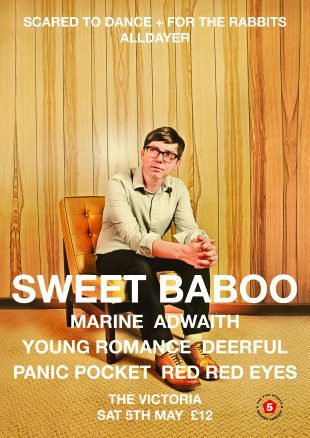 An eclectic and intriguing songwriter, Sweet Baboo is a master of gorgeous upbeat acoustic ditties, psychedelic exploration and wide-screen 1960’s pop. While likely to showcase material from across his impressively eclectic back catalogue, the set should borrow heavily from last year’s Wild Imagination, “the perfect pick-me-up to the winter of our discontent.” It was an album written as an antidote to our times, an attempt to free himself of negativity and dare to dream of a brighter tomorrow. Musically, the record stepped away from the Harry Nilsson-esque love song of 2015’s The Boombox Ballads and into a world of positivity, the resultant music sounded like the missing middle ground between Arthur Russell and The Beach Boys. An intriguing artist, always pushing at the boundaries of any attempt to pigeonhole himself or his music, Sweet Baboo is firmly established as one of music’s most intriguing experimenters and most important voices. On their recently released debut album, Fable Electric, London-quartet, Marine quickly set about living up to all the hype around them. Drawing comparison to the likes of Warpaint and PJ Harvey, Marine make the music of contrasts, driving beats and hypnotic a-melodic bass sit menacingly beneath intricate vocal harmonies and hook-laden guitar lines. Marine take the extraordinary stuff of legend and place it firmly into the everyday world that surrounds them, theirs is the sound of four different musicians growing through the cracks in the urban landscape and combining to something far greater than the sum of their parts. One of Welsh music’s fastest rising new bands, Adwaith are the trio of Hollie, Gwenllian and Heledd. Loosely described as post-punk, Adwaith’s sound seems to trace a lineage of arty musical outsiders from The Slits through to Datblygu – whose member Patricia Morgan helped Adwaith develop their sound. The band have released a number of singles, showcasing various sides of their music from the wistful, folkish wonder of “Pwysau” to the more energetic alt-rock of “Haul” and the emotional beauty of recent single, “Fel I Fod”. Lyrically they tackle sexism, political injustice and personal crisis, flittering between English and Welsh with impressive ease. Since their formation six years ago Young Romance have gone about building a reputation as a thrilling live prospect. Even before releasing any records they’d shared stages with the likes of Mystery Jets and Slow Club. Those early shows were time well spent; honing their sound which pairs Paolo’s searing, heavily effected guitar lines with Clare’s primal pounding drum beats, and heartbreaking, intricate vocals. They released their excellent debut album, Another’s Blood, back in 2016 and this will be a chance to hear material from the upcoming, as yet untitled follow-up. Deerful is the solo-electronic project of indiepop academic, Emma Winston. Armed with an array of miniature synthesisers, Deerful’s sound is a combination of soaring choral vocals, and twitching processed beats. Debut album, Peach, came out last Summer on WIAIWYA, an album about affirming the ordinary and vital; it was a reminder that whatever was going on in the world, there are still tiny shared moments that make life still well worth celebrating. Panic Pocket have wasted no time in making their mark on the London DIY-scene. Sophie and Natalie released their debut single back in January, showcasing a penchant for bedroom anti-folk and glitchy electro-pop. Cathartic songs about shaking off bad relationships, the life-changing nature of female-friendship and the perils of online dating, are all delivered with a wry sense of humour and an undeniable charm. Red Red Eyes are the Cambridge-based duo of Laura McMahon and Xavier Watkins. Their sound is one of cinematic drones and intricate twanging guitars, as if Enio Morricone teamed up with Broadcast to write the soundtrack for the best post-apocalyptic film you’ll ever see. The band are set to release their debut album Horology in May, a record where soft, almost hushed vocals are accompanied by intricate, delicate guitars and waves of dark, melancholic synths. Hanya headline the Scared To Dance and For The Rabbits gig night on Friday 6th April at The Victoria. Entry is free and support comes from Two Tribes. 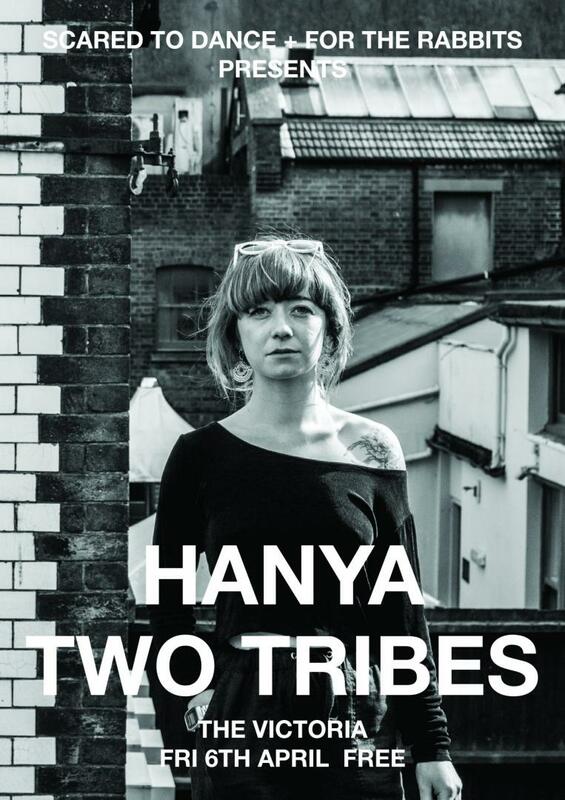 Formerly operating under the moniker of Post-Heather, Hanya are a two-piece shoegaze duo hailing from Brighton. Fronted by chief songwriter, Heather Sheret, their sound combines the ethereal beauty of the Cocteau Twins or Mazzy Star, with a more driving, guitar-led sound akin to acts like Angel Olsen or Ty Segall. The duo released their debut double-A single, Airplane/Stone last year, and with new material in the pipeline don’t miss the chance to see hear just how exciting this band could be. They may have only formed ten months ago, and not yet released any music into the world, yet East London quartet Two Tribes have already made quite the impression. Their growing reputation has been cemented courtesy of a series of high-profile support slots, culminating in a packed out debut headline set at The Shacklewell Arms. Describing their sound as synth-psych, the band cites influences from Talk Talk to School of Seven Bells. With new recordings on the way soon, this will be a chance to check out one of the capital’s most exciting new bands before their reputation explodes. 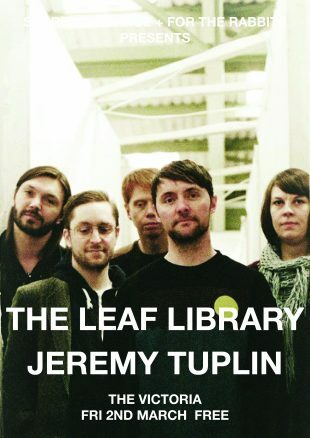 The Leaf Library headline the Scared To Dance and For The Rabbits gig night on Friday 2nd March at The Victoria. Entry is free and support comes from Jeremy Tuplin. 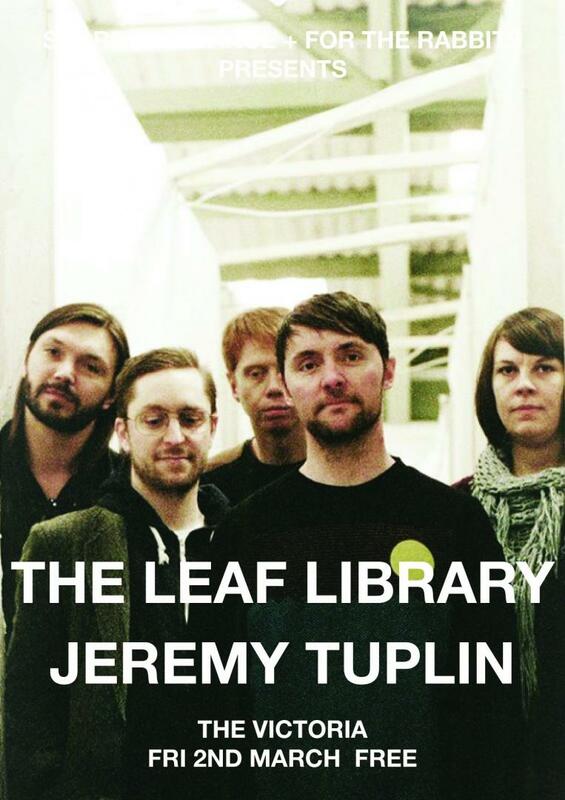 The Leaf Library make multi-layered, two-chord drone pop, channelling the warm fuzz of Yo La Tengo, the spacious repetition of Talk Talk, and Movietone’s seaside. The band released their debut album, Daylight Versions, on WIAIWYA back in 2015, a collection of hazy, drone-laden love songs to meteorology and the sea, which received backing from the likes of Uncut and The Guardian among others. Live they add a volume and intensity to their recorded material, driving motoric rhythms sing out atop bed of synths, weaving guitars and whatever a variety of guest performers bring on the day from flugelhorns to saxophones. The band released double A-side single “City In Reverse”/”Kendrick Road” in October 2017, and are currently working on their second album due for release in 2018. Somerset born, London based songwriter Jeremy Tuplin is a musician equally influenced by Andy Shauf and documentaries about space. Courtesy of his rich Bill Callahan like baritone he weaves lyrical paintings, equally as likely to be odes to Albert Einstein as musings on the fleeting nature of youth. Throughout his most recent album, I Dreamt I Was An Astronaut, there is an attempt to fuse the minutia of everyday living, with all its heartbreaks, money worries and existential crises, with the wider questions of the universe and our tiny, almost insignificant place in it all. Performing solo here, this will be a rare opportunity to hang off his every crafted word. Jean K headline the Scared To Dance and For The Rabbits gig night on Friday 2nd February at The Victoria. Entry is free and support comes from Winnaretta. Jean K are a new four-piece band based out of East London. The band started as the brainchild of Strasbourg-born singer Jean Kern alongside producer Michael Tomlinson, now fleshed out to a live band with the help of keyboardist Laura and bassist Gordon. The band formed with the noble aim of infusing indiepop with a much-needed disco twist. Jean K’s debut single, “Billy”, a dancefloor homage to Kurt Vonnegut’s absurdist classic Slaughterhouse Five, was released last year on Crocodile Records. 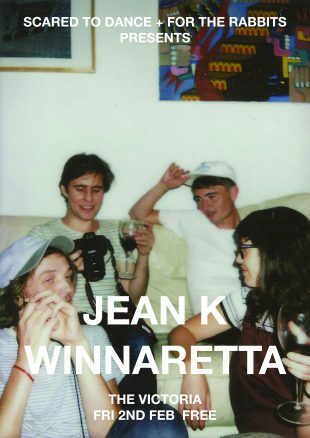 Music that challenges both your mind and your feet; it doesn’t come much more exciting than Jean K.
London-based trio Winnaretta burst onto the DIY-scene last year with their debut EP, Mine, recorded at Soundsavers Studio with the ever excellent Mark Jasper. The band deal in catchy pop songs infused with complex rhythms and tight harmonies. 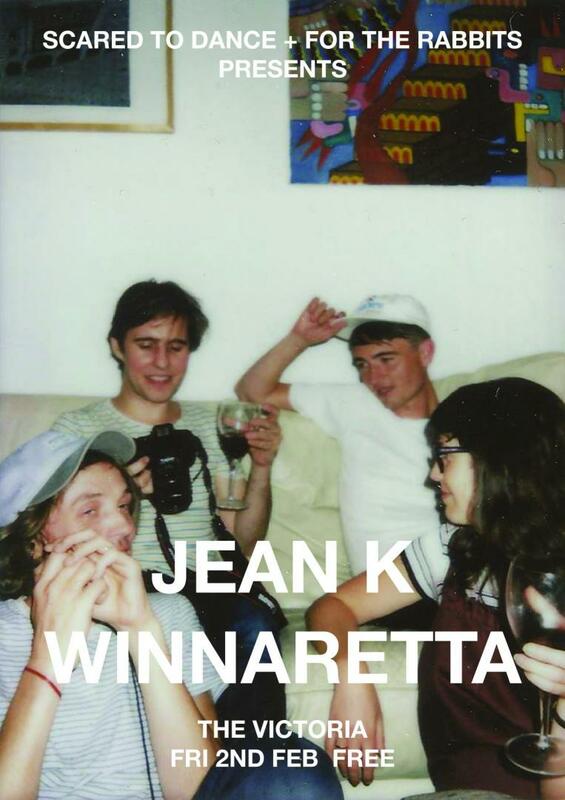 Mine might be barely fifteen minutes long but it packs in everything from afro-beat to slacker-rock; coupled with a reputation as one of the best live acts in the capital, Winnaretta are a band not to be missed. They do things loud, DIY and queer. Firestations headline the Scared To Dance and For The Rabbits gig night on Friday 12th January at The Victoria. Entry is free and support comes from The Great Electric. This year is looking like a huge one for London five-piece Firestations. Freshly signed to The Pictish Trail’s Lost Map records, the band are set to release their new album The Year Dot. Recorded over three years in their own home studio in Walthamstow, it is very much a DIY-creation, but anything but a lo-fi one, the band’s attention to detail and obsession with finding the perfect sound creating a lush and absorbing listen. The first new material since 2014’s debut Never Closer, The Year Dot is a record that refines and expands on Firestations’ shared musical vision. Starting with simple pop songs, the band add layers of drones, vocal harmonies, electronica and complex, intriguing rhythms, and create a sound entirely their own. Recent single “Build a Building” is a fine entry to Firestations’ world, a downbeat track about feeling like a cog in a wheel presented with a breezy pop melody and sun-drenched vocal harmonies. 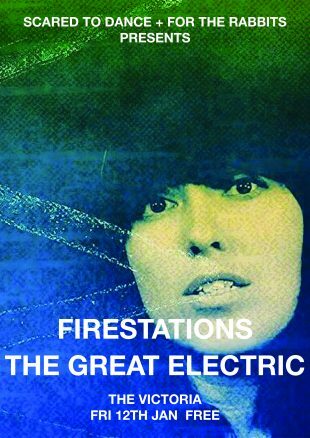 With support from Austin Town Hall, The Little Indie Blog and DIY among others, Firestations look on the verge of something very special. Featuring alumni of bands as diverse as Kenickie, Hefner and Go-Kart Mozart, The Great Electric need little in the way of introduction. Formed back in the winter of 2012, the band recently release their self-titled debut album on the ever-reliable WIAIWYA imprint to critical acclaim. Their first new material in three years, since their debut EP for Static Caravan, it was time well spent on a beautifully crafted album. The band’s sound is shaped by a shared love of classic German electronic and progressive acts of the 1970s coupled with the pop music sensibilities, hooks and production of 90s groups such as Stereolab, Quickspace, Pram and Electric Sound of Joy – or to quote most reviews they sound a bit like Neu! Scared To Dance presents Withered Hand on Saturday 16th December at The Shacklewell Arms. Support comes from Papernut Cambridge and tickets can be bought from WeGotTickets. 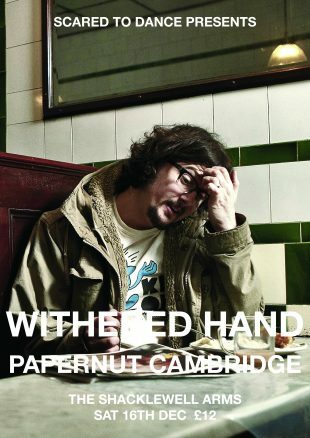 Withered Hand is the songwriting output of Dan Willson. A cult figure in the Scottish music scene since 2009, Willson has released two widely acclaimed albums, New Gods (2014) and Good News (2009) and several lo-fi EPs. He has recorded several BBC radio sessions and played various festivals as well as collaborating with the likes of King Creosote and Eugene Kelly. Currently working towards his third full-length album, Withered Hand continues to tour and play one-off dates in venues from concert halls to living rooms. Papernut Cambridge is a collective based around Ian Button, formerly of Death in Vegas and Thrashing Doves. Onstage they are represented by Button and an ever-changing cast of musical friends including Darren Hayman, Jack Hayter, Ralegh Long, Robert Rotifer, Robert Halcrow, Citizen Helene and many others. They have released several albums on Gare du Nord Records.